This month Chris and I have our hands full with family fun. I have been practicing that teaching as I spend my days like a tourist seeing the sights and enjoying time away from the studio. 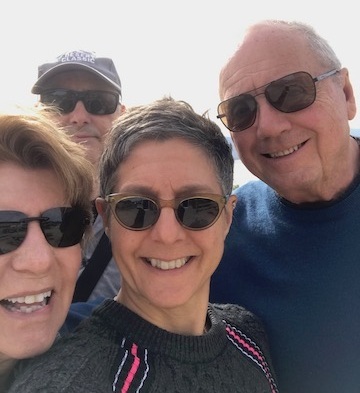 Last week, the parents and I spent day at the Palm Springs Art Museum looking at the Unsettled exhibition. It is a massive show featuring the artwork of Los Angeles artist Ed Ruscha along with works by 79 other artists covering 2,000 years of territory. These are big issues with complicated perspectives but I thought the show provided a traversable path to conversation about the greater West and our place in it. Local artists like Andrea Zittel and Phillip K. Smith have works included in the show so for me the exhibition was an opportunity to connect with art and the lineage of art in the this region. I hope you can make the time to see Unsettled as well as the incredible outdoor installation exhibition Desert X. Right now the valley is filled with creation. 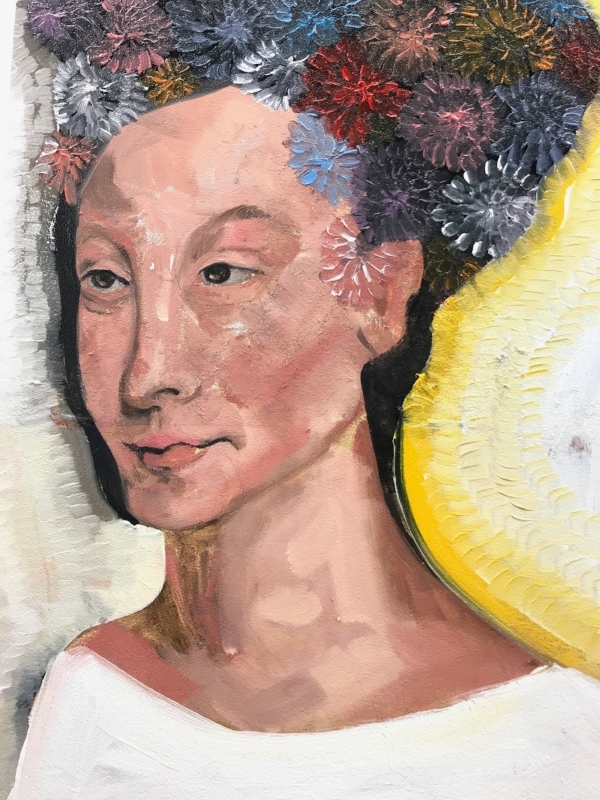 On a more personal note, The Artists Council, a newly independent non-profit organization, organization which has helped me to connect with artists and exhibit my work, will be holding their inaugural juried exhibition Metamorphosis. 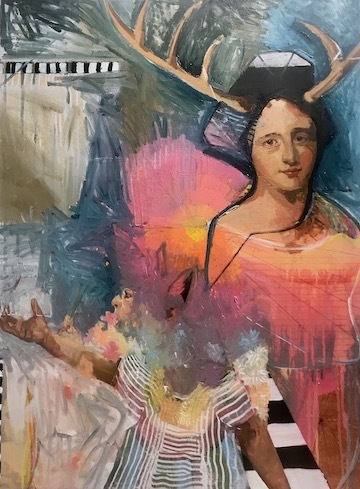 My painting, Ciervo, a new work about interconnectedness and transformation has been selected for inclusion in the exhibition. If you are in town, I hope you can join us for the opening reception on March 28th from 6-8 PM At the Palm Springs Art Museum, Palm Desert. The venue is located at 72-567 Highway 111 Palm Desert California, 92260. For me, the theme reinforces the inevitability of change and its necessity for growth. But change is not always easy. It requires letting go, death and rebirth. For example, here in the valley we have been blessed by the beauty of the painted lady butterfly migration. Amidst this wonder, I am faced with the fragility and fleeting existence they embody. Below is a copy of the statement included with the my submission for the exhibition. I wanted to thank curators Mary Ingebrand-Pohad and Alma Ruiz for including Ciervo in the show. Understanding the breadth of human experience requires a comprehension and acceptance of metamorphosis. The only constant is change and within the ever-changing turnings of mind and body, I find an ever changing truth. In my paintings, pleasure and pain represent the ends of a rainbow that is human experience. Sensation in the body triggers a response which arises as pleasure, pain or anything in between. Attachment and aversion to these temporary states not only lessens the expanse of our existence but the resulting reaction distorts our perceptions. While painting, I use the signifiers of body and abstraction to help advocate living a fully alive life. Using icons from history, direct experience and my imagination, I create characters and their worlds that allow, invite and embody change. Free from the disabling distortions of glomming on and avoidance, my work advocates metamorphosis. The exhibition runs through April 12th so even if you can’t make the opening, please stop by. In retirement one of the unexpected joys has been seeing how former yoga students have taken the teachings and created new successes. Cook like a yogi is a blog created by three of my students: Marty, Savitha and Stephanie. They created a site where cooking and good food are integrated with yoga practice. The combination helps you create a healthy life that is full of joy. This month it was an honor to be featured on their blog. During the holiday season it is good to reflect on our relationship with food. These musings help me to make good choices each day. Below is the interview but be sure to check out their site to see other great stories and recipes. 1. What came first your interest in yoga or cooking? I would have to say cooking came first. I come from an Italian family and cooking is central to my sense of joy and togetherness. When I began practicing yoga though, my ideas around cooking and food transformed. 2. During your years of growing CCY, what diet were you practicing? Has that changed in your retirement? 3. What were some of the biggest sacrifices you made growing your business? I loved my business and I can only talk about sacrifice in terms of “sacred offering”. A sacred offering is something freely given. Everything I had to offer up in order to be there for our community was a joy. Our endeavor was an “all in” kind of thing; we put the community first. Every lease we signed required a personal guarantee; basically, we offered everything we had with every studio we opened. It was an amazing ride. 4. You are an avid cyclist, what fuels you best for your rides? 5. Does yoga and cycling inspire your life as an artist? Yoga and cycling take care of my body and mind so that I can make art. When I head into the studio each day I am alone, in silence, with nothing but raw materials and me. In order to create, I have to be relaxed with that situation. Cycling in the morning gets my blood flowing and gives me time to connect with friends. Yoga at the end of a studio day gets the kinks out. It re-centers my mind and gives me an opportunity to let go of the day. These two activities are central to my art practice. My life is simple; I ride, make art, and practice yoga as a core. In addition, I have joined a local artists council where we meet for critiques, book club and socials. I have also joined the desert bicycle club board of directors to help facilitate our cycling communities growth and mission. Chris and I travel a bit on weekends to hear live music or look at art, but mostly we like to be in the valley. We have made terrific friends and the national parks in our area are awesome. 7. Tell us what chop wood carry water means to you? Chopping wood and carrying water are examples of daily activities that facilitate a normal, comfortable life. The phrase is a shortened version of before enlightenment, do the tasks of your life and after enlightenment, do the tasks. The aphorism reminds me to come back to the grounding practices of life no matter how good or bad circumstance may be. So if something terrific and exciting is happening I make sure to chop wood and carry water. Furthermore, if life is full of sadness and loss, I use the practice of daily life to help remain on the steady terrain that is me. 8. What is your most meaningful yoga pose? Yoga poses on their own are not meaningful to me though many of them have associations that are full of inspiration. Myths, gods, animals, or even prescriptive qualities attached to poses by creative teachers can make the pose in itself seem magic, but it’s not. What is meaningful to me about the physical practice is that it provides an opportunity to put mind and body together. The physical practice also gives me the opportunity to undo any tension or overuse of certain muscle groups, thereby creating balance in my body. Do I have a favorite? I always look forward to camel and forward fold. I dread standing balancing poses because I can only do them on one side. 9. What is your favorite cookbook? 10. What is your favorite memory of a great meal? My grandparents lived in a small beach house on Long island. Every summer we would stay there over the 4th of July. My grandfather would take my brother and I to the stinky mudflats where we would clam and scour the rocks for mussels. We would pick bushels of the little mollusks. Then the aunts would arrive; one would bring the mozzarella, still warm from uncle making it. The other would bring bags of squash blossoms to fry and course there was always pasta and sauce. Got to say that summer feast was my favorite meal, always. Did I mention we would finish with ricotta pie? 11. What is the most essential ingredient in your kitchen? 12. Please share a favorite recipe. This is a favorite fall recipe from the Torre Italian cookbook. The soup-like pasta is very nourishing and warming. Sauté oil, garlic and red pepper in a pan, do not over brown the garlic. Add onion and salt well, sauté until translucent. Add one can of peas and one package of frozen peas, heat through. Add one box of organic vegetable or chicken broth to make a kind of soup. Don’t overcook and don’t cover. Boil pasta in salted water. Keep the pasta very firm and reserve 1 cup of cooking water. Drain the pasta lightly and toss into the pea mixture, add reserved pasta water as necessary. Serve with fresh grated Parmesan and black pepper. October marks what we in the desert call “the beginning of the season”. The weather cools down and the snow-birds (winter-only residents) begin to return. Basically this means more people and lots to do. This month I will be: exhibiting a painting in the Palm Springs Artist Council’s Juried exhibition, finishing an exciting commission (witing about it in the next newsletter), riding my bike and exploring new avenues in paint. Furthermore, Kelly Laughlin, artist, traveler, and yogini, came for a visit last month. She made a studio visit and wrote an inspiring blog post. 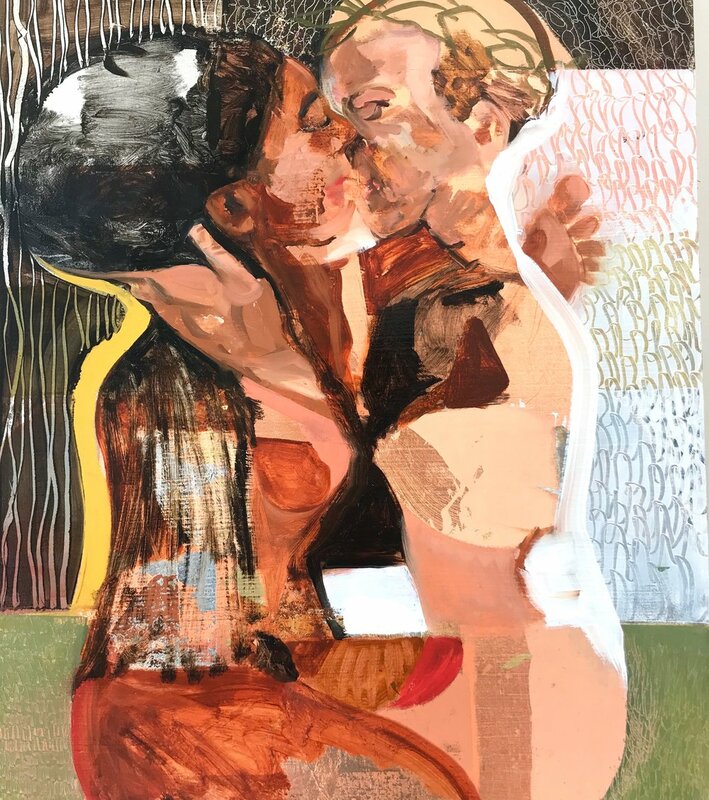 Reception: 6:15 - 8:00 p.m.
below is the Kelly Laughlin post, please read and check out additional offerings on her website. after six weeks of driving, i arrived in california. crossing the border, i noticed the sand, the hills, the open sky. the vast expanses of winding highway, the beautiful desert. the first stop i made in california was to palm desert, to have lunch and a swim with kim manfredi. originally from baltimore, kim is an artist, a teacher, and an avid cyclist; her teachings were instrumental in the early development of my yoga practice. her vision to create, grow, and expand the charm city yoga network of studios (now operated by yogaworks) provided me, along with our vast community, with the space to find a home within our bodies, within our communities, within ourselves. now, within her new space as a california resident, i see much of the same determination and care that kim applied to her work in baltimore present in her new existence in california. kim is an incredible soul. devoutly dedicated to movement and making, she approaches each practice with great care and attention. in the hot august sun, we swam in her pool, noticed the growing dates on the nearby palm trees, and talked about the necessity of dedication, the need to practice. the primary yoga teaching, according to patanjali, promises freedom when the practitioner can stand in silence with clear insight; when I cycle, I feel victory, defeat and everything in between. I apply the teachings of yoga recognizing the evaluations in my mind as subjective, relative, and simply opinion. the same is true while painting. this understanding liberates me from my own smallness and drops me in the sea of immortality. km: I am lucky enough to be in the flow of art-making each day. it is important that I begin most days with cycling because. it gets me outside, into the weather with the visual stimuli of nature. 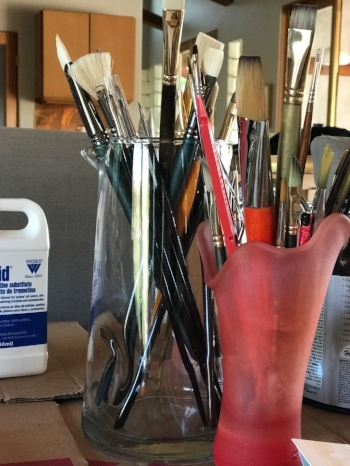 after breakfast I head to the studio; depending on where I am with a particular painting, I take time to do something routine like mixing colors, priming boards, or simply cleaning up. these tasksThis immerses me in the studio environment and I feel at home. when the painting begins I also stay aware of my thinking: I notice if I feel sure; if not, I offer a reminder to do my best. if I am critical, I offer a reminder to be kind. if I am anxious, I let myself paint more freely. km: I read a lot. I am always reading a novel and an art based writing. right now I am reading everything by- john berger. he’s an art critic that hates being called an art critic. I can understand why; this guy is an artist who paints with words. currently, I am reading portraits. as berger profiles each artist he restricts the reader’s visual access to the work. he offers a small black and white image of a work of art while relying on the verbal illustration to move us into the painters’ universe. his literary approach to each artist or genre gives me insight and perspective that is stimulating on many levels. I love it. click on the image below to order the book. It’s been about a year since my last post. Thanks for your patience. I have been immersed in the process of painting and it has been marvelous. For a time in Baltimore I had to give up my oil painting practice for the yoga studios. I was happy to do it, working in watercolor and collage between teaching and running a community; it was plenty. Now without the pressure of business, I have built an art studio and taken time in relative quiet to mix colors, practice drawing, and sit in the stillness of a daily painting practice. I paint about 6 hours a day. My mornings begin early, just like my yoga days, with a bicycle ride. During the group ride with awesome friends, I connect and get all my socializing in. Home by nine, I paint all day. I find these long periods of solitude allow me to remember my imagined world and its inhabitants. My artworks are basically pictures of this world. As a result of my yoga practice, I recognize that long periods of sustained concentration are possible. The years of daily practice on the mat and the months spent on retreat in India have given me tools to ride the discoveries found in painting. Like the saboteur in yoga, I notice inner commentary on the works I make. Judgment and fear could paralyze my painting but after years of bearing strong sensations from trying to put my leg behind my head or sitting in meditation, I can paint even when I feel insecure. Success in a yoga pose is temporary and I find success in painting is temporary too. There is always another problem to solve or a new path to follow in the next work of art. This is what keeps me going. I will be exhibiting Polka Dot Jersey at the Palm Springs Art Museum in October. I hope you enjoy looking at the work and I hope it inspires you to do your practice everyday, no matter what the form. All forms of love take us home. Self Portrait (detail) water color and Crayola 5" x 7"
I walked into the desert where I met a new life. To my delight and terror, I disappeared. Weather Moving, watercolor and Crayola 8" x 8"
Not really, but the prosaic walk into the desert is no joke. The Kena Upanishad asks us to wonder, Who am I? When my circumstance is new and different, that question seems extremely relevant. It has taken peace and solitude to ponder. A friend wrote recently asking about the blog. Are you going to write soon, she said? I smiled and replied, I have not published It’s A Beautiful Practice because I can see that my world is different. I am changed and I am keeping a bit quiet for now, as a means of honoring and observing. Sometimes quiet is a kind of worship. Like mantra practice…if you keep the thought in your heart it just keeps growing. My life is full of beautiful things these days, art, yoga, friends, reading, biking, and yes even golf. I spend most early mornings drawing. I cook, swim, nap and enjoy life. These last few weeks I have been reading Flannery O'Connor, perhaps I will blog about her brilliance soon. Chris and I are not alone, kind people arrive when we need them: an old friend from school, yoga community, bike club, a golf teacher. Here are some drawings I have made since my arrival. They are simple, just watercolor and crayon. Part of who I am these days is an artist. We are converting our garage into a beautiful painting studio and I have agreed not to pull out my paint until then. The studio is well on its way and I have purchased supplies. Painting time is near; I can't wait! After Avery, water color and Crayola 6" x 6"
Robert and Perry, water color and Crayola, 6" x 6"
Summer Storm, water color and crayola, 6" x 6"
Mesa, water color and crayola, 8" x 8"
A Cloud, Watercolor and Crayola, 4" x 4"
I'm off to practice my 90 minutes of yoga before it gets too hot. I hope you enjoy the drawings and I'll be in touch soon. PS Class registration for my July 7th classes are now open, 11 – 12 AM at Fells Point and 6:30- 7:45 at Midtown. Also if you are a YogaWorks teacher you can join our teacher workshop 1- 2:30 at Midtown. Finally, you can also sign-up for my December 1, 2, 3, workshop on the Shiva Samhita and Pop-up classes at Midtown that same weekend. Why wait? I have been asking myself, where is home? Is it in Baltimore, California, the yoga studio, or on my mat? I've been living at my parent's house for the first time in 30 years. I feel so grateful for their hospitality and find myself calling it home. I drive my dad's car, and we go to yoga together. My mom cooks for me, and I wear her clothes. Also while I am in Charm City teaching, many students meet me with love. They wish me well and share the latest excitement in their practice and their lives. I find myself calling the studio home. Today, back in Palm Desert, I see my husband at the airport and say to Chris, it’s good to be home. Recently life has been a wild ride: twenty–two days in India, two weeks in California, teaching a lot of teacher training, packing and unpacking everything we own. Somehow, though, I manage to feel grounded. I maintain a sense of myself, a feeling that I belong. When I step on my mat, no matter where I am, I feel at home. Brene Brown says love and belonging happen when we present our authentic, imperfect selves to the world. And everything is not perfect: I have been traveling a lot, and that takes a toll on my body. I neglected to take care of some important details and forgot an appointment. I was hurt, and I hurt in return. But still, I practice, teach, and feel as if there is a place for me. The real me. One of my favorite Buddhist stories helps illustrate the idea of authenticity and belonging as a prerequisite for feeling at home. A monk mentions to his guru that he is leaving the rural ashram to live and practice in the city. The teacher reminds the monk how dangerous urban life can be. "They will verbally assault you for wearing your robe and carrying a begging bowl," the master says. “But what if they do hit you," the teacher replied? "These are dangerous people." “If they hit me I will feel grateful that they did not stab me,” the monk said. “Ah, but what if they do stab you?” The teacher asked. "My dear monk friend, what if they do kill you,” remarked the teacher? In this story, the monk is rooted in home. He maintains a connection to his sense of self and community even as he plans to move to a dangerous place. This connectedness allows him to continue to love in the face of pain. He is authentic in his assertion. He finds a way to look on the bright side. Brown gives us a three-step plan to develop a persistent sense of home. 1. Cultivate the courage to be imperfect, to set boundaries, and to allow ourselves to be vulnerable. 2. Exercising compassion that comes from knowing that we are all made of strength and struggle. 3. Nurture connection and a sense of belonging. Home can only happen when we believe we are enough. Brown also reminds us that cruelty always hurts, even if the criticisms are untrue. She reminds us of the pitfalls of perfectionism as an obstacle to authenticity. Her definition of perfectionism includes the belief that if we live perfect, look perfect, act perfectly; we can minimize or avoid the pain of blame, judgment, and shame. Perfection is not a successful strategy for living without pain. A natural sense of belonging arises when I am grateful. You and I can be imperfect together. We can ask for help. Like yoga postures, finding authenticity and a feeling of belonging is a practice. Its fruit is happiness. We experience, like the monk, happiness for what is going right. We find joy in the bright side of things. This practice can make us more pleasant to be around. It can also release hormones that make us feel better. Physically and emotionally we now have the endurance to complete our endeavors with more skill and more vigor. We feel at home wherever we are. Be who you are, it is enough, and you belong.